UNEX engineers design material handling systems that will meet the strategic and operational goals of customers’ businesses. From system conception to engineering to final implementation, UNEX is with you every step of the way to guarantee a project’s success. UNEX is a one-stop shop for made-to-order material handling and order picking equipment, including engineering and design, manufacturing, and analysis. At UNEX, our goal in the engineering process is to design and deliver a complete solution, saving your engineering department and your company money and time by doing the heavy lifting for them. Our engineering team has over 75 years of experience combined in applications engineering and design in the material handling industry, and has a practical, in-depth understanding of material handling systems and how they operate. Combining this perspective with the use of today’s most-advanced modeling and analysis tools, along with the latest material handling equipment and applications, leads to implementable proposals that optimize space and labor utilization in a facility. We profile current and projected material flow, product movement and picking strategies to design the best material handling system to meet customers’ needs. When designing order picking systems, UNEX engineers look at the characteristics of the product being handled, speed or velocity of pick, quantity of orders, picks per order, quantity of items per pick, picks per SKU and total number of SKUs. We take into consideration whether customers are handling case- or piece-picking operations or full pallet loads. All of these characteristics are required when designing and engineering a successful order-picking project. The best part of all of this? This engineering support- including drawings- is provided absolutely free of charge. We don’t simply provide a pile of posts, beams, track, and accessories and let your engineers figure out the rest- our engineers design the system for you based on your requirements and provide drawings and documentation to support your team throughout the implementation process. This allows your engineering team to focus on improving processes in other areas. 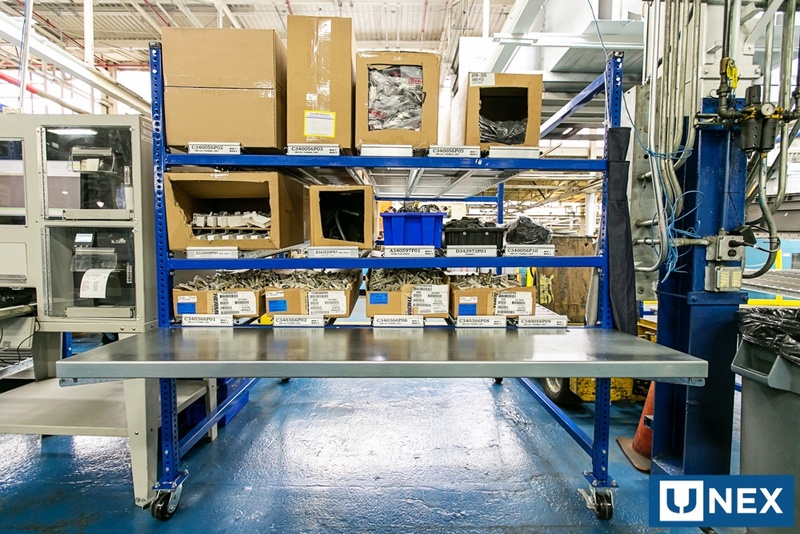 For assembly workstations, UNEX engineers design for usability, productivity and efficiency while taking into account ergonomics to avoid injury and increase performance. A good workstation design for assembly operations involves lean principles, which means designing for minimal wasted movement. This includes designing the workstation for comfortable reaches, less walking and minimal searching for parts, tools or pieces. All assembly “ingredients” are placed at the operator’s fingertips so they can reach for a part without moving their eyes from what they are doing. We grasp a thorough understanding of your current situation, as well as of your company’s goals for future growth. With these parameters in mind, our engineering staff designs the best quality material handling, order picking and storage system that delivers a quick return on investment. If you would like to learn more about how UNEX can save you time and money with our engineering services, schedule a one on one meeting with a member of our team at booth 1119 Assembly Show. We’ll give you a full run-down on the services and solutions we provide, discuss your specific points of pain, and help you discover a UNEX solution that solves them. Click the button below to get started!